Jade Etherington has today won her third medal of the Sochi 2014 Paralympic Games by finishing second in the women's visually impaired slalom behind Russian skier Aleksandra Frantceva. In the same event the face of SportsAid's I Will fundraising campaign Mille Knight (see photo) finished fifth - a superb result for the 15-year-old who is the youngest winter Paralympian in the history of British sport. Her support from SportsAid helped her to find a new guide to ski with but Millie says the foundation of her success is her mum Suzanne - who until recently skied with her as her guide. "My mum loves skiing, the mountains and the great outdoors so she is my inspiration and it's her fault that I have inherited that passion but she does not like the speed so much anymore. "When we first started racing, to keep the costs down my mum was my training and race guide. We even managed a bronze at IPCAS level. She is amazing. She sacrifices so much of her own time and money so that I can ski for the British Disabled Ski Team. My mum and I are are a great team!" Mille received a SportsAid Award last year while Jade was a member of the Talented Athlete Scholarship Scheme, which SportsAid manages, between 2008 and 2013. Call Breege Zachary or Simon Worsfold at SportsAid on 020 7273 1978 or 020 7273 1734 or email breege@sportsaid.org.uk or simon@sportsaid.org.uk. At London 2012 almost two-thirds of the British team were former recipients of SportsAid’s support, winning 20 of Team GB’s 29 gold medals and 27 of ParalympicsGB’s 34 gold medals. 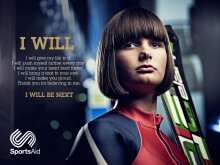 The athletes supported by SportsAid are typically aged 12 to 18 and are among Britain’s brightest hopes for the future. The SportsAid Awards they receive are funded by the charity’s donors and supporters. They recognise the athletes’ achievements and help them meet the high costs of training and competing, which they otherwise have to pay for themselves. Olympic champion Amy Williams welcomes new support for young skeleton and bobsleigh athletes. Charity seeks new partners to match-fund its £30,000 commitment to the next generation.